Nuance Solutions is proud to announce the promotion of Tim Schuett to Technical Director! 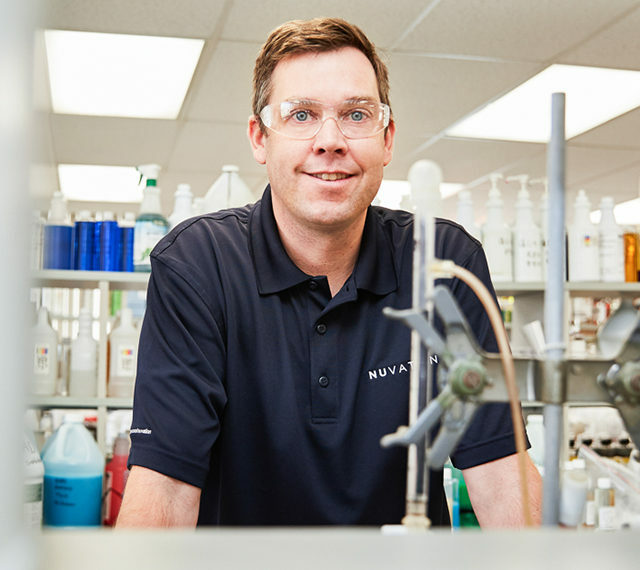 In this new role, Tim manages the Nuance Technical team in all laboratory activities including research and development, quality control and technical services. Tim combines a very logical and innovative mind with a passion for hands-on involvement in products and processes. His strong bench talent and real-world field experience gives him a unique perspective and approach to his work. Tim first joined the team at Nuance as a Senior Chemist/Formulator in July of 2016. His primary roles were to develop formulas for the industrial and NuVation divisions of Nuance. He also oversaw the scale-up activities to produce the formulas in the plant. Before joining the Nuance team, Tim graduated from Indiana University with a B.S. in Chemistry in 1998. He began his career in quality control, later moving to laboratory-related technical services. In this role, he gained valuable insights to field-related application issues. He then broadened his experience by developing cleaning recommendations for customers in the pharmaceutical and personal care markets. From there, he added formulation work in those markets and gained experience in industrial laundry products. Throughout the years, Tim maintained close contact with field sales by supporting them with developing and improving cleaning processes. Please join us in congratulating Tim! We look forward to seeing him shine in his new leadership role.